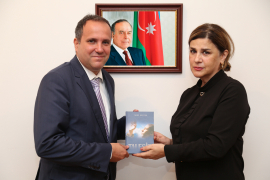 The Azerbaijan Translation Centre (AzTC) on Thursday received a visit from H.E. Mr Viktor Szederkenyi , Ambassador Extraordinary and Plenipotentiary of Hungary to the Republic of Azerbaijan. The sides focused on perspectives to expand literary and cultural ties between Azerbaijan and Hungary, AzTC’s related international literary projects, and publication of works by famous Hungarian prose writers Imre Kertész, Istvan Gall and others in Khazar World Literature Magazine over time. The sides also discussed the project to publish in Hungary the Anthology of Modern Azerbaijan Literature, as well as to publish a collection of books in Azerbaijan to include works by Hungarian writers and poets. In conclusion, Afaq Masud donated to the honorary guest the book Fatelessness by Imre Kertesz, Hungary's first Nobel laureate in literature published by AzTC.